I loved footy. But I had to be satisfied with running the boundary for my little brother’s footy team and helping my Dad coach the boys. That was as close to playing footy as I could get. It was frustrating, to say the least. I kept thinking, If a girl can kick a ball and run and tackle and do everything a boy could do with a footy, why can’t she play for real? I never wanted to play footy against the boys. I knew there were physical strength differences that made that impractical. There was never a desire to compete with boys. It was purely the love of the game that drove me to start the competition. It was still a very sexist society when the WAWFL kicked off. The Football Development Trust (FDT) had not long been in operation. It was one of their jobs to promote the sport at whatever level, they were happy to help. I was lucky enough to be put in touch with Brian Cook who was the General Manager of the FDT. Brian is now the General Manager of the Geelong Football Club.Brian and I talked about what I wanted to achieve. It was fairly simple. I wanted to be able to play footy, regularly. I needed a competition and I was prepared to do whatever I could to make that happen. I figured if we could hold a scratch match to test the interest of other girls/women in Perth that would give us an indication of whether a competition was viable. The FDT paid for the ad in the West Australian. 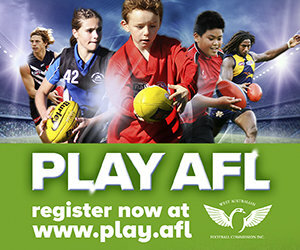 It invited women interested in playing Aussie Rules footy to contact me. In those days there were no mobiles. So I was pretty much stuck to the phone in my parent’s kitchen for hours from the point where the ad. went to press. I took the names of 60 women and organised some training sessions with the help again of Brian.The FDT had all the contacts. They helped me with coaches, balls, ovals and support for what I was doing. The WAWFL were assisting with venues as well. We even had a couple of training sessions on Subi oval with coaches like Barry Cable. The coaching was very much focused on skills development. We were all young enough to have a decent level of fitness. 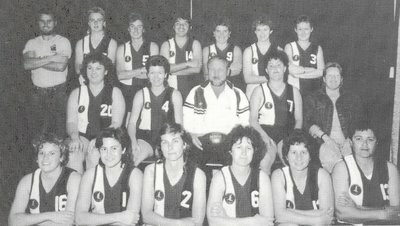 We had a fair bit of media interest too because it was a bit out there women playing footy back then. The media weren’t always kind. One senior player commenting on TV that we should stick to cheerleading. Wonder how he feels now?? Our first match was played at South Fremantle Oval in front of a small crowd of family and friends. The ABC did a story about it on the 7:30 Report. The match was a success. I couldn’t even tell you who won. It didn’t matter, because the main goal was to get women out onto a footy oval to play a game. We enjoyed it and all celebrated together in the club rooms afterwards. We did it all again a bit later, just to prove it wasn’t a fluke. It wasn’t, so the decision was made to form a league and start a competition. Some of the group of players involved in the scratch matches came along to a meeting where we adopted a set of by-laws and a constitution. I was voted as inaugural President and we formed a small committee to get things started. The by-laws had been based around a hybrid version of Amateurs and Juniors rules. We were some adults and some older teenage women playing a sport we had never played competitively before. Whilst some players were naturals, most of us had to learn some footy skills as we went. 15 a side. This rule was to assist with numbers whilst we developed the competition. Size of the ball - It was my theory that most women don’t have hands the size of men. So we used an under 15s size footy. We figured that we were probably a closer fit, size wise, to a teenage boy than a man on average. Soccering the ball – restricted for kicking in the goal square. For the same reason the juniors did it. To teach the girls/women to pick up a footy and kick it. 25 meter penalty – We didn’t play on a full size oval and we didn’t all kick 50 meter punts, so this was a reasonable penalty. We tried to spread as far around the metro area as possible. You could only play for the closest team to your residential address. This was to prevent everyone going to one or two teams. If you wanted to play for a team outside your area you had to get a clearance from the league.Now I think about it, I am pretty sure there would have been some workarounds used by some of the players that were keen on certain teams! The second season saw the introduction of another team from Curtin Uni to make it a competition of 5 teams. This was good because on the week your team got a bye, you could go and watch one of the other matches. We played on the same oval for both matches each week to start with, to try and get some spectators from the other game. It also made for more socialising after the match back in the club rooms. Everyone got on pretty well and we were all one big group after the games were over.I stuck around as President for 4 seasons. I knew by the time I left, that the WAWFL had a life of it’s own. It was going to survive as a competition and most importantly grow.In the time that I was involved, I had a vision for the competition to develop to include youths, bridging the gap between the junior comps. for boys and girls and our own women’s comp. Interstate footy never appealed to me as much as a strong local competition. It has it’s place, but to me interstate footy was only for a few lucky ones. It was the weekly comp. that was going to benefit the majority of women and girls, so that was always my focus. I came back and played a couple of seasons as a player after having a couple of years off. By then there were 6 teams in the comp. I really enjoyed playing and played my best footy in those 2 seasons for Vic. Park and Belmont. Mainly because I no longer had the pressure of running the competition. But also because I got to play with some great players under a great coach – Norm Woods. I also got to enjoy the thrill of winning a grand final. Belmont beat Innaloo after losing to the unbeaten Innaloo all season - 1997. 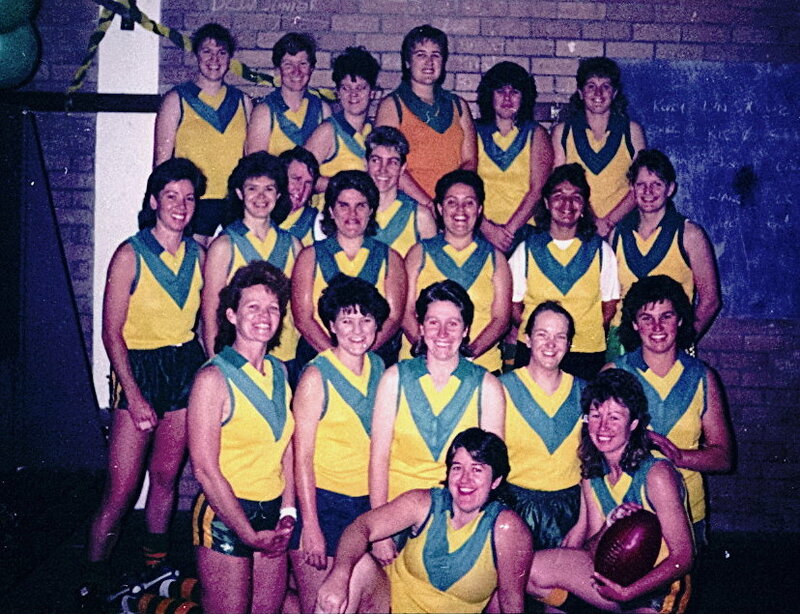 This year I had the pleasure of organising an inaugural Vetran’s footy match to celebrate the WAWFL 25th anniversary. It had been talked about for a while so it seemed like the right time. We had a lot of fun training for 6 weeks to get some of that footy fitness back to get us through the match. The game was a lot of fun and it was impressive to see the skills of the retired players were still there, if not the fitness. We raised over $1000 for the Leukemia Foundation in honour of Norm Woods who was one of the coaches of WAWFL for many years. Norm lost his battle with Leukemia 2 years ago so it was fitting that we dedicated the match to Norm and we played for the Norm Woods Shield. Huggy’s Heroes won the day, but just like that original scratch match 25 years ago, the real winner was Women’s footy. If adopted by the WAWFL, the Vetran’s comp., will add another pathway for women’s footy players in WA. I couldn’t be prouder of the WAWFL. It has developed into an impressive organisation with a very well structured competition, providing pathways for young girls to play footy at many levels. Thanks largely to a dedicated group of devoted people over the years that have given a huge amount of their time and effort to ensuring women and girls can continue to play the best Aussie sport.